As I read this book again, I feel it still stands as one of my favorites in the classics. To me, it's very compelling that I love this book so much when it talks about something that could be so dark and menacing with the theme of the French Revolution. Each time I read this, I am not only merely entertained but I learn a little something more about this story and its view into the vague window of humanity. So, for this book review I thought I would answer some of those questions that could be discussed in a book group which I hope will give you a sense of the book and what it is about. Even more than that I hope that you'll want to read it at least once and even if you don't like it as much as me, I hope you'll gain a new perspective for that is what so much of great literature does for me. Also, I must warn you that there are spoilers below if you haven't ever read this book before. 1. What is the author's opinion of the old ways of the French nobility? Is the narrator impartial or ally him/herself with a class, a country, a cause? Right away, even in the very first paragraph of this novel, it grips my attention and I get a feel for the environment of the French Revolution. It is not overly gory but provides a depth of description so that you understand what is going on. I feel the conflict of the Nobility(noblesse) vs. the citizen(citoyen). The author shares her resentment of the ignorance and brutality of the lower classes which made me ponder about the nobility, who held not only held the money but the education of France. If they kill them off then where does that leave the country. Simply put it is a double-edged sword. I also perceive England through the eyes of a group of Englishman and reasonably wonder if they would have dared interfere with their diplomatic relationship with French Republican government. 2. Let's talk about Sir Percy. How is point of view a crucial device in the rendering of Percy? Everyone laughed-the Prince more loudly than anyone. I do not forget him, his laughter or poems about the Scarlet Pimpernel in high society and so I am constantly reminded of this mysterious character too. It is a classic unfolding of a character transformed into the birth of a hero so differently than had been presented beforehand. This impact of using p.o.v. for the hero of this story where it leaves one wondering and questioning then becoming amazed at the reality in the end which was foreshadowed beforehand. I enjoy how the characters and the story unfolds itself. 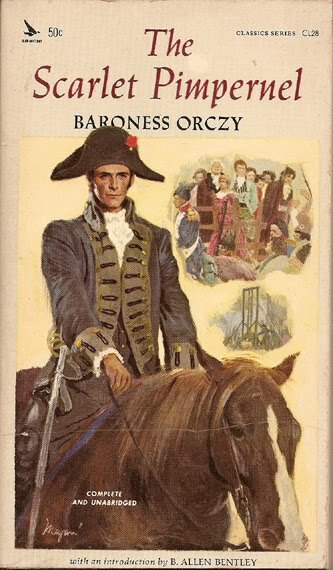 I enjoy reading about Percy with his bouyancy and all his flaws yet he is heroic in his own epic way. As mentioned in the Introduction in my copy of the book, this creative dual heroism can still be found today in the likes of Batman, Zorro, Superman to even elements as seen in the movie, The Princess Bride. Brilliantly charming, this ideal is definately part of the heroes of our dreams today. 3. 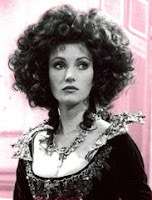 At wha t point does Lady Blakeney become a sympathetic character? Would you consider her an unlikable character at first? Marguerite suffered intensely. Though she laughed and chatted, though she was more admired, more surrounded, more f^eted than any woman there, she felt like one condemned to death, living her last day upon this earth. I enjoy what Marguerite brings into the story, her sense of propriety and fashion, her teasing, the way she intimidates and the way the narrator wonders how Percy was able to catch her. I love the way it is described about how Percy looks at her. I love the complexity of their relationship and mystery of her thoughts. It's enveloping as their world shared together seems different from the world they are living with others around them. I felt I must continue reading in order to find out their secrets and if their relationship will survive or destruct. She is definately intriguing and complex. 4. 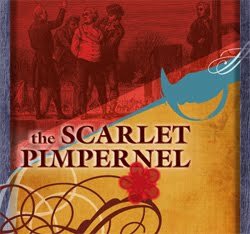 How is the Scarlet Pimpernel flower a larger motif for the themes of the novel? Does it fit Percy as a character? I have realized now that I seem to love books that have motif's of birds or flowers. I love when they are truly encapsuled in the story. I love how and what this simple red flower foreshadows in the story. From the first notice of this flower, it becomes a symbol for the hero throughout the book. 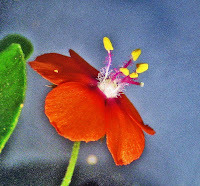 The Scarlet Pimpernel... is the name of a humble English wayside flower; but it is also the name chosen to hide the identity of the best and bravest man in all the world, so that he may better succeed in accomplishing the noble task he has set himself to do. Scarlet Pimpernel is a low-growing kind of plant that is wild and flowering. Since it is bright red, it suggests that it comes from the Prime rose family. It is a constant growing flower in spite of rain or overcast conditions. This flower evokes a powerful emotional imagery and it succeeds in being a memorable emblem for the hero. It is pleasant to look at and be around yet eccentric and definately leaves a lasting impression. I do think this flower fits Percy as a character right as it sounds, don't you think? 5. Would the novel have been more satisfying with a different resolution, or does the resolution as Orczy presents it fit the tenor of the book as a whole? Although, I do imagine other ways this novel could have ended, overall, I enjoyed the resolution of the novel. I felt there are still unanswered questions yet a satisfactory closure. I love the romanticism and feeling of a fairy-tale like discovery between Marguerite and Percy that seem to exhibit a conciliation for them against all of the odds. 1789: French Art During the Revolution, catalogue of an exhibition in New York held at Colnaghi from October 10 through November 22, 1989. Exhibition organized and catalogue edited by Alan Wintermute. Published by Colnaghi, 1989. Great way to present this Julie! This too is one of my favorite books, even like it better than the movie. The author was so clever. You've reminded me that I should read it again soon! Thank you so much, Lula! I'm happy that you like it and I wonder what you'll think on your reread. Great review! Thanks for commenting on mine even though we don't have share the same opinion. Quite a few of my book club friends enjoyed it when we read it together. Great review! I remember in high school a friend trying to make me watch this movie and I hated it! I've never had the desire to read this book since then but your review makes me reconsider my position on the book. Thanks and a BIG welcome to those from Radiant Reviews at Chrissie's Corner! 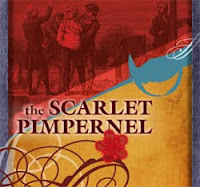 I have never read The Scarlet Pimpernel before but it is one of those books I have always felt that I should read. Hopefully I'll get around to reading it soon!